The Cuban dengue vaccine program relies on the subunit vaccine based on two specific viral regions: the domain III of the envelope protein and the capsid protein. Previously, we reported the immunogenicity and protection capacity in mice and monkeys of the chimeric protein DIIIC-2, formed by the two described viral regions, highly aggregated with the ODN 39M and adjuvanted in alum. In the present work, different quantities of the ODN 39M were tested for their immunogenicity in mice. As a result, the formulation containing the protein aggregated with 2 µg of the ODN was the optimal condition in terms of cell-mediated immunity thereby; it was selected to be further studied. The second mice experiment was directed to study the effect of the formulation dose on their immunogenicity and protective capacity. Results revealed the best immunogenicity profile for the lowest quantity tested whereas the protection assay revealed an inverse behavior. Upon virus challenge, the group inducing the lowest immune response generated the best protection profile and only 40% of protection was obtained in the group generating the highest immunogenicity. Taken together we strongly recommend performing a dose study in non-human primates to find the optimal dose for inducing the best protective response. Keywords: Dengue, vaccine; viruses; immunogenicity; experiment; study. El programa de vacuna contra el dengue cubano confía en la vacuna de subunidades basado en dos regiones virales específicos: el dominio III de la proteína de la envoltura y la proteína de la cápside. Anteriormente, se informó de la capacidad de inmunogenicidad y protección en ratones y monos de la proteína quimérica DIIIC-2, formado por las dos regiones virales descritos, muy agregados con el ODN 39M y adyuvadas en alúmina. En el presente trabajo, diferentes cantidades de la ODN 39M se ensayaron para determinar su inmunogenicidad en ratones. Como resultado, la formulación que contiene la proteína agregada con 2 g de la ODN fue la condición óptima en términos de la inmunidad mediada por células de ese modo; fue seleccionado para estudiar más a fondo. El segundo experimento los ratones fue dirigida para estudiar el efecto de la dosis de la formulación en su inmunogenicidad y capacidad protectora. Los resultados revelaron el mejor perfil de inmunogenicidad para la cantidad más baja ensayada, mientras que la protección de ensayo reveló un comportamiento inverso. Tras la exposición al virus, el grupo de inducción de la respuesta inmune más bajo genera el mejor perfil de protección y se obtuvo sólo el 40% de la protección en el grupo de la generación de la más alta inmunogenicidad. En conjunto le recomendamos realizar un estudio de dosis en los primates no humanos para encontrar la dosis óptima para inducir la mejor respuesta protectora. Palabras clave: Dengue, vacunas; virus; inmunogenicidad; experimento; estudio. There are several dengue vaccine candidates at advanced preclinical and clinical levels although no vaccine is still licensed. The most advanced strategies (Phase II-III) are based on live attenuated viruses and are led by the Sanofi Pasteur´s ChimeriVaxTM-dengue vaccine candidate. Despite the balanced reactogenicity and immunogenicity profile of the tetravalent ChimeriVaxTM-dengue vaccine candidate, three doses are required during one year to induce high neutralizing antibody seroconversion rates against the four serotypes.2 Despite such levels of immunity, unfortunately, the three efficacy trials revealed lack of solid protection against DENV-1 and DENV-2.3 In addition, neither data is available about the induction of functional cell-mediated immunity (CMI) not about the duration of the protective induced immunity post-vaccination. Based on the aforementioned results the present work is directed to study the influence of the quantity of the ODN 39M, or the mixture protein-ODN, on the immunogenicity and protective capacity in mice of the final formulation. A preparation from suckling mice brain infected with DENV-2 (NGC strain) was used as antigen for antibody detection (Clarke and Casals, 1958). A similar preparation obtained from brains of non inoculated mice was used as a negative control. For virus challenge a preparation of infective DENV-2 (A15 strain) (4.5 x 105 pfu/mL) was used. It was obtained by homogenization of suckling mice brain infected with DENV-2 RPMI-1640 medium. For animal immunization and neutralizing antibodies detection, clarified cell culture supernatant harvested from Vero cells infected with DENV-2 (SB8553 strain, kindly provided by Dr. M.J. Cardosa, University Sarawak, Malaysia) (105 pfu/mL) was used as viral stock. A concentrated preparation of DENV-2 was used for the in vitro stimulation of mouse splenocytes. Supernatant from Vero cells infected (100 mL) with 106 pfu/mL of SB8553 DENV-2 strain was concentrated by centrifugation at 32,000 rpm for 4 h at 4°C. The pellet containing the virus was resuspended in 1 mL of phosphate buffered saline (PBS). A mock preparation was similarly prepared from the supernatant of uninfected Vero cells. Female BALB/c (Bc, H-2d) mice (aged 6–8 weeks) were purchased from the CENPALAB (Havana City, Cuba), and housed in appropriate animal care facilities during the experimental period. Animals were handled according to the Cuban Institute of Health Guidelines for the humane use of laboratory animals. The purification of the recombinant protein was basically according to Marcos et al, 2013. Briefly, the supernatant from disruption in TE buffer was exchanged to 10 mM Tris/HCl, 7 M Urea, Tween 0.5%, pH 8 using Sephadex G25 fine (Pharmacia, Sweden). The supernatant was gently shacked during 1 h at 4 °C before the application onto the SP Sepharose FF resin (Pharmacia, Sweden), with the same buffer. The column was washed with 30 mM DEA, 7 M Urea, Tween 0.5%, 200 mM NaCl, pH 10.3 (washed buffer), to eliminate contaminants. Then, the recombinant protein was eluted using 30 mM DEA, 7 M Urea, Tween 0.5%, 750 mM NaCl, 15 mM Imidazole, pH 10.3 (elution buffer). For the second chromatography step the elution from the SP Sepharose column (containing the protein DIIIC-2, 65% of purity) was applied onto the Chelating Sepharose FF resin (Pharmacia, Sweden), previously equilibrated with the same buffer. The protein was eluted using 30 mM DEA, 7 M Urea, Tween 0.5%, 750 mM NaCl, 250 mM Imidazole, pH 10.3. Finally the protein was refolded using Sephadex G25 fine to TE buffer and was stored at -20 °C until next experiments. The purified protein DIIIC-2 was subjected to an in vitro assembly procedure as previously described with few modifications.15 Briefly, 400 μg of the recombinant protein DIIIC-2 were incubated with the ODN 39M (ATCGACTCTCGAGCGTTCTCGGGGGACGATCGTCGGGGG) in TE buffer. The reaction mixture was incubated for 30 min at 30°C and finally stored at 4°C. 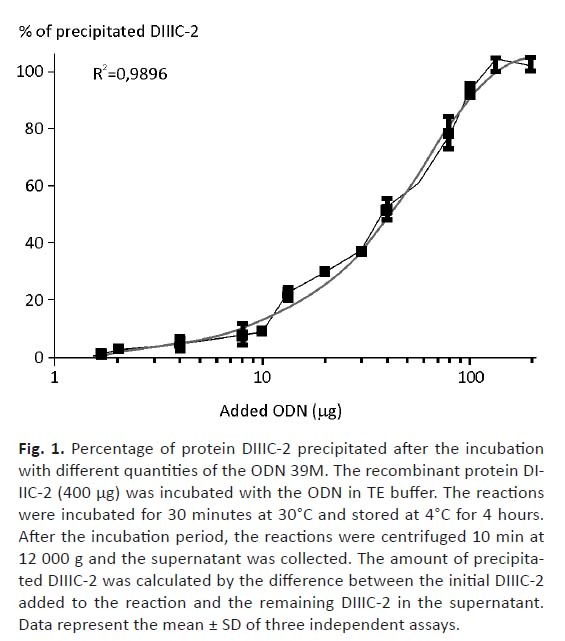 To study the relationship between the quantity of the ODN 39M and the protein DIIIC-2 precipitation, different in vitro assembly reactions were carried out varying the final concentration of the ODN. The reactions were assessed as described above and each condition was made by triplicate. The table 1 shows the conditions evaluated in the experiment. After the incubation period, the reactions were centrifuged 10 min at 12 000 g and the supernatant was collected. The quantity of precipitated DIIIC-2 was calculated by the difference between the initial DIIIC-2 added to the reaction and the remaining DIIIC-2 present in the supernatant. The DIIIC-2 concentration was determined by the Bicinchoninic Acid Protein Assay kit (Sigma, Missouri, USA) following the procedure recommended by the manufacturer. To quantify the concentration of the ODN 39M present in the supernatant of the in vitro assembly reactions, 5 µL of the sample were diluted in 2 mL of TE buffer and the absorbance at 260 nm was determined. 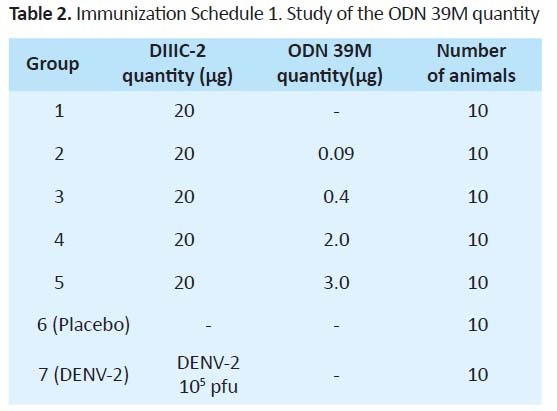 An immunization schedule was conducted to study the effect of the quantity of the ODN 39M on the immunogenicity of the final preparation containing DIIIC-2, and adjuvanted in alum. Seven groups were included (table 2). Mice received three doses at 0, 15 and 30 days, by intraperitoneal route. In the case of the positive control group, animals received only one dose of the infective virus (105 pfu) by sc route, without adjuvant. Animals from each group were partially bled 30 days after the last dose and sera were collected for further immunological analysis. One month after the last dose they were splenectomized to study the cellular immune response. 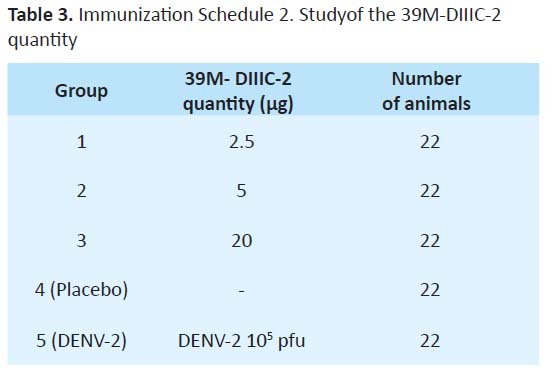 A second immunization schedule was conducted to study the effect of the quantity of the total preparation 39M-DIIIC-2, adjuvanted in alum, on their immunogenicity and protective capacity. The quantities assayed as well as the different groups of animals are described in table 3. One month after the last dose, twelve animals from each group were intracranially injected with 20 μL of a suspension of DENV-2 infected suckling mouse brain containing 50 median lethal doses (LD50) (1.6x103 pfu/ml). Mice were observed daily for 21 days and deaths were recorded. The maintenance and care of experimental animals used in this research complied with the Cuban Institute of Health Guidelines for the humane use of laboratory animals. An amplified sandwich ELISA system was used to detect the anti DENV-2 IgG antibodies. Polystyrene plates with 96 wells (Costar, Cambridge, MA) were coated for 2 h at 37°C with 100 µL per well of a mixture of anti DENV human immunoglobulins (IgG) (5 µg/mL) in coating buffer (0.16% Na 2CO3 and 0.29% NaHCO3; pH 9.5); then they were blocked in coating buffer containing 5% powder skim milk for 1 h at 37°C and washed three times in PBS containing 0.05% Tween 20 (PBS-T). The viral antigen (100 µL per well) and the negative control antigen were incubated overnight at 4°C. After three washes with PBS-T, 100 µL per well of sera from each group were tested by serial dilutions in PBS-T, starting at 1:1 000. Plates were incubated for 1 h at 37°C and washed as described above. Later, 100 µL per well of 1:35 000 diluted anti mouse IgG peroxidase conjugate (Amersham Pharmacia, Beckinghamshire, U.K.) were added and the plates were incubated for 1 h at 37°C. After washing, 100 µL per well of 0.04% substrate O-phenylenediamine in buffer (2% Na2HPO4 and 1% citric acid; pH 5.0) was added. The plates were kept for 30 min at room temperature and the reaction was stopped with 50 µL per well of 2.5 M H2SO4. Absorbance was read at 492 nm in a SensIdent Scan device (Merck, Helsinki, Finland). The positive cutoff value was set as twice the mean absorbance value of the negative control sera. Neutralizing antibody titers were measured by plaque reduction neutralization test (PRNT) in VERO cells as previously described.16 The strain DENV-2 SB8553 was used in this test. The neutralizing antibody titer was identified as the highest serum dilution that reduced the number of virus plaques by 50%. As a positive control, a murine hyperimmune ascitic fluid was used which recognizes the antigens on the surface of DENV-2. Spleen cells were obtained in aseptic conditions and erythrocytes were lysed by adding NH4Cl 0.83% solution. Cells were washed twice with PBS 2% Fetal Bovine Serum (FBS) (PAA Laboratories, Ontario, Canada) and resuspended at 2×106 cells/mL in RPMI 1640 medium (Sigma Aldrich) supplemented with 100 U/mL penicillin, 100 μg/mL streptomycin (Gibco, UK), 2 mM glutamine (Gibco, UK), 5×10−5 M 2-mercaptoethanol (Sigma St. Louis,MO) and 5% FBS. Finally 2.5×105 cells/well were cultured in 96 well round bottom plates with the antigens (1.25×104 pfu and 2.5×105 pfu of DENV-2 antigen for mice experiment # 1 and # 2, respectively) or mock preparation. Concanavalin A (Sigma St. Louis, MO) was used as a positive control. In all experiments three wells were plated for each antigen. After 4 days of culture, culture supernatants were collected and stored at -20 °C. The culture supernatants from splenocytes previously stimulated with each antigen were analyzed in duplicate to determine the IFN-γ concentration by ELISA using monoclonal antibodies (MAb) pairs (INF-γ; Mabtech, Nacía, Sweden). ELISA protocol recommended by manufacturers was used with slight modifications. The lowest limit of detection of cytokine was 4 pg/mL. For the statistical analysis the GraphPad Prism version 5.00 for Windows (GraphPad Software, San Diego, CA) was used. The normal distribution of data was analyzed with D’Agostino Pearson’s test and the variance homogeneity with the Bartlet’s test. When normal or transformed data showed a normal distribution a parametric test was performed, otherwise data were analyzed with a non-parametric test. The parametric analysis of more than two groups was performed by a one-way analysis of variance, using the Tukey post-test. The non-parametric analysis of more than two groups was performed using Kruskal Wallis and Dunn Multiple Comparison test. Survival data from the protection assay were analyzed with the log rank test. In all cases *: p<0.05; **: p<0.01; ***: p<0.001. The ODN 39M was used to define the curve between the quantities of ODN added to the aggregation reactions and the aggregated protein DIIIC-2. Different quantities of ODN were incubated with DIIIC-2. After the incubation period, the remaining protein was determined in the reaction supernatants and the precipitated DIIIC-2 was calculated. As shown in Figure 1, a typical dose-response curve was detected (R2=0.9896). It is very important to mention that no ODN was detected in the supernatant of any of the samples tested. A first mice experiment was conducted to study the influence of the ODN 39M quantities used during the aggregation reaction, on the immunogenicity of DIIIC-2. Three additional control groups were included in the study receiving: the non-aggregated protein, the Placebo formulation (negative control) and the infective DENV-2 (positive control). All groups of animals immunized with the recombinant protein DIIIC-2 developed high titers of antiviral antibodies without statistical differences among them (p>0.05), regardless the quantity of ODN 39M added in the formulation. In turn, all groups receiving the protein DIIIC-2, whatever the condition, elicited antibody titers statistically higher than those detected in the placebo group and the positive control group. Similarly to the previous results, the positive control group induced low titers of antiviral antibodies, without statistical differences with respect to the placebo group (p>0.05) (Figure 2A). The neutralizing capacity of the antibodies was assessed by PRNT. In agreement with the results from the ELISA aforementioned, all groups immunized with the recombinant protein DIIIC-2 induced detectable titers of neutralizing antibodies without statistically differences among them (p>0.05) (Figure 2B). Low titers were detected in sera from the DENV-2- immune animals. On the other hand, the percentage of responders was equal or more than 75% for the groups receiving the aggregated protein in the different conditions tested. In contrast, only the 37.5% of animals elicited neutralizing antibodies in the group immunized either with the non-aggregated protein or with the infective virus. The splenocytes from animals immunized with the aggregated protein using 2 µg and 3 µg of the ODN 39M as well as those from the positive control group were able to secrete IFN-γ upon in vitro stimulation with DENV-2, with statistical differences (p<0.05) with respect to the cytokine secretion in the placebo group. The levels of this cytokine for the groups immunized with the aggregated protein with 2 µg and 3 µg of the ODN and the group immunized with DENV-2 were 2323.8 pg/mL; 2260 pg/mL and 1952.6pg/mL, respectively, without statistical differences among them (p>0.05). No significant secretion was detected for the non-aggregated protein was well as for the groups receiving 0.09 µg and 0.4 µg of ODN 39M. (p>0.05) (Figure 3). Based on the results from the first mice experiment the quantity of 2 µg of ODN 39M was selected for the aggregation process of the protein DIIIC-2. This formulation was named 39M-DIIIC-2. A second mice experiment was conducted to study the influence of the quantity of the formulation 39M-DIIIC-2, on the immunogenicity and protective capacity of the preparation adjuvanted in alum. Two additional control groups were included in the study receiving the Placebo formulation (negative control) or the infective DENV-2 (positive control). The humoral and cellular immune responses were determined after the last dose. The neutralizing capacity of the antibodies was assessed by PRNT. 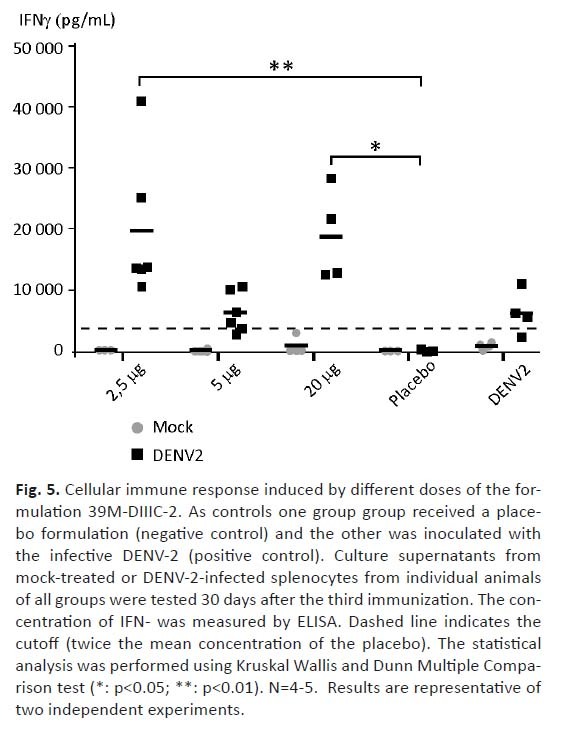 In contrast to the results from the ELISA, all groups immunized with the formulation 39M-DIIIC-2 induced detectable titers of neutralizing antibodies without statistically differences among them (p>0.05) and similar to those detected in sera from the DENV-2- immune animals (p>0.05) (Figure 4B). The splenocytes from animals immunized with 2.5 µg and 20 µg of the formulation 39M-DIIIC-2 were able to secrete IFN-γ upon in vitro stimulation with DENV-2 (19654 pg/mL and 18912 pg/mL, respectively) with statistical differences (p<0.05) with respect to the cytokine secretion on the placebo group. Moreover, the IFN-γ secretion levels for animals immunized with 5µg or the positive control did not exhibited statistical differences compared to the placebo group (p>0.05) (Figure 5). One month after the last dose, the protective capacity was assessed using the mouse encephalitis model. After the observation period upon challenge with DENV-2, the survival rate of the groups receiving 5 µg and 20 µg were 87.5% and 70% respectively, significantly higher than the percentage obtained in the negative control group (p<0.05) and without statistical differences compared to the positive control group (100 %) (p>0.05). On the contrary, only the 44.4% of mice receiving the low dose formulation (2.5 µg) survived upon challenge, without statistical differences compared to the negative control group (p>0.05). It is well known the influence of the dose used for vaccination on the immunogenicity of such a vaccine. Our group previously demonstrated that a vaccine candidate composed by the protein DIIIC-2, aggregated with the ODN 39M and adjuvanted in alum, was able to induce protection in mice and monkeys against de homologous virus.13 Nevertheless, a dose study to determine the influence of the quantity of the ODN 39M or the mixture protein-ODN on the immunogenicity of the final formulation has not been carried out. The first mice experiment of the present study was directed to select the best quantity of ODN required for the proper immunogenicity of the DIIIC-2 protein. 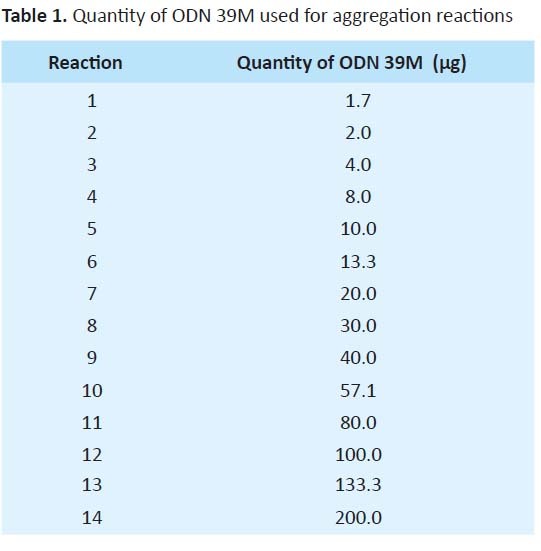 The different doses studied corresponded to different mass protein: ODN ratios during the in vitro aggregation reaction. Upon analysis of the curve quantity of ODN vs. percentage of DIIIC-2 precipitation, a typical dose response behavior was detected. It was also interesting to note the lack of free ODN in the soluble fraction upon incubation with the protein, regardless the quantity added. Probably, the total quantity of the ODN assayed is required to aggregate the protein as insoluble forms, indicating that these quantities are limiting in all the reactions. The second mice experiment was designed to study the effect of the quantity of the formulation 39M-DIIIC-2, in their immunogenicity in mice. The mass ration protein: ODN 10:1 was kept since it was the best condition for inducing a proper immune response from the first mice experiment (2µg of the ODN 39M). Interestingly, the best immunogenicity profile, measured by ELISA against DENV-2 and IFN-γ secretion, was induced with the lowest quantity of the vaccine preparation. These results demonstrate the critical role of the vaccine dose for inducing a potent immune response. Probably, 2.5 µg is the best quantity to be properly presented to the mice immune system by intraperitoneal route. These results are in accordance to those reported by Clements et al., 2010.20 They demonstrated in NHP that the lowest dose of a subunit vaccine (80% of the E protein of DENV-2 expressed in Drosophila S2 cells) using ISCOMATRIX as adjuvant, induced the best antiviral immune response. Unexpectedly, in our work, the protection rates did not match with the immunogenicity profiles. The lowest percentage of protection was obtained in the group receiving 2.5 µg, which developed the best immunogenicity. On the contrary, the best protection rates were obtained in the groups receiving the highest doses of the vaccine preparation. This contradiction should be carefully investigated, mainly based on the mouse animal used as well as the readout assayed: the survival. We have determined that the peak of viral load in the brain of infected mouse did not match with the maximal time of death thereby probably; the immune system is playing a role on the pathogenesis of the disease in the mouse encephalitis model. Additional experiments should be conducted to prove such a hypothesis and validate the survival or other readout as a proper marker for protection in the mouse encephalitis model for DENV. In addition, based on the present study we strongly recommend performing a non-human primate study with different vaccine doses, so as to define the best one to induce a proper protective immune response in an animal model closer to humans, using viremia as readout to measure protection. 1 Bhatt S, Gething PW, Brady OJ, Messina JP, Farlow AW, Moyes CL, et al. The global distribution and burden of dengue. Nature 2013;496:504-7. 2 Morrison D, Legg TJ, Billings CW, Forrat R, Yoksan S, Lang J. A novel tetravalent dengue vaccine is well tolerated and immunogenic against all 4 serotypes in flavivirus-naive adults. J Infect Dis 2010;201:370-7. 3 Sabchareon A, Wallace D, Sirivichayakul C, Limkittikul K, Chanthavanich P, Suvannadabba S, et al. Protective efficacy of the recombinant, live-attenuated, CYD tetravalent dengue vaccine in Thai schoolchildren: a randomised, controlled phase 2b trial. Lancet 2012;380:1559-67. 4 Chen Y, Maguire T, Marks RM. Demonstration of binding of dengue virus envelope protein to target cells. J Virol 1996;70:8765-72. 5 Crill WD, Roehrig JT. Monoclonal antibodies that bind to domain III of dengue virus E glycoprotein are the most efficient blockers of virus adsorption to Vero cells. J Virol 2001;75:7769-73. 6 Hung JJ, Hsieh MT, Young MJ, Kao CL, King CC, Chang W. An external loop region of domain III of dengue virus type 2 envelope protein is involved in serotype-specific binding to mosquito but not mammalian cells. J Virol 2004;78:378-88. 7 Gil L, Lopez C, Blanco A, Lazo L, Martin J, Valdes I, et al. The cellular immune response plays an important role in protecting against dengue virus in the mouse encephalitis model. Viral Immunol 2009;22:23-30. 8 Zellweger RM, Eddy WE, Tang WW, Miller R, Shresta S. CD8+ T cells prevent antigen-induced antibody-dependent enhancement of dengue disease in mice. J Immunol 2014;193:4117-24. 9 Weiskopf D, Sette A. T-Cell Immunity to Infection with Dengue Virus in Humans. Front Immunol 2014;5:93. 10 Weiskopf D, Angelo MA, de Azeredo EL, Sidney J, Greenbaum JA, Fernando AN, et al. Comprehensive analysis of dengue virus-specific responses supports an HLA-linked protective role for CD8+ T cells. Proc Natl Acad Sci U S A 2013;110:E2046-E2053. 11 Valdes I, Bernardo L, Gil L, Pavon A, Lazo L, Lopez C, et al. A novel fusion protein domain III-capsid from dengue-2, in a highly aggregated form, induces a functional immune response and protection in mice. Virology. 2009 Nov 25;394(2):249-58. doi: 10.1016/j.virol.2009.08.029. 12 Valdes I, Gil L, Romero Y, Castro J, Puente P, Lao L, et al. The chimeric protein domain III-capsid of dengue virus serotype 2 (DEN-2) successfully boosts neutralizing antibodies generated in monkeys upon infection with DEN-2. Clin Vaccine Immunol 2011;18:455-9. 13Gil L, Marcos E, Izquierdo A, Lazo L, Valdes I, Ambala P, et al. The protein DIIIC-2, aggregated with a specific oligodeoxynucleotide and adjuvanted in alum, protects mice and monkeys against DENV-2. Immunol Cell Biol. 2015 Jan;93(1):57-66. doi: 10.1038/icb.2014.63. 14 Zust R, Toh YX, Valdes I, Cerny D, Heinrich J, Hermida L, et al. Type I IFN signals in macrophages and dendritic cells control dengue virus infection: implications for a new mouse model to test dengue vaccines. J. Virol. July 2014; 88(13): 7276-85. 15 Marcos E, Gil L, Lazo L, Izquierdo A, Brown E, Suzarte E, et al. Purified and highly aggregated chimeric protein DIIIC-2 induces a functional immune response in mice against dengue 2 virus. Arch Virol 2013;158:225-30. 16 Morens DM, Halstead SB, Repik PM, Putvatana R, Raybourne N. Simplified plaque reduction neutralization assay for dengue viruses by semimicro methods in BHK-21 cells: comparison of the BHK suspension test with standard plaque reduction neutralization. J Clin Microbiol 1985;22:250-4. 17 Krug A, Rothenfusser S, Hornung V, Jahrsdorfer B, Blackwell S, Ballas ZK, et al. Identification of CpG oligonucleotide sequences with high induction of IFN-alpha/beta in plasmacytoid dendritic cells. Eur J Immunol 2001;31:2154-63. 18 Vollmer J, Weeratna R, Payette P, Jurk M, Schetter C, Laucht M, et al. Characterization of three CpG oligodeoxynucleotide classes with distinct immunostimulatory activities. Eur J Immunol 2004;34:251-62. 19 Verthelyi D, Ishii KJ, Gursel M, Takeshita F, Klinman DM. Human peripheral blood cells differentially recognize and respond to two distinct CPG motifs. J Immunol 2001;166:2372-7. 20 Clements DE, Coller BG, Lieberman MM, Ogata S, Wang G, Harada KE, et al. Development of a recombinant tetravalent dengue virus vaccine: immunogenicity and efficacy studies in mice and monkeys. Vaccine 2010;28:2705-15. 1 Vaccines Division, Center for Genetic Engineering and Biotechnology, Ave. 31, P.O. Box 6162, Playa, Havana 10 600, Cuba. vector, Autopista Novia del Mediodía, km 6 ½ P.O. Box Marianao 13, Havana 11 600, Cuba.